First published in 1991. This work is about training and special education needs in the international arena. 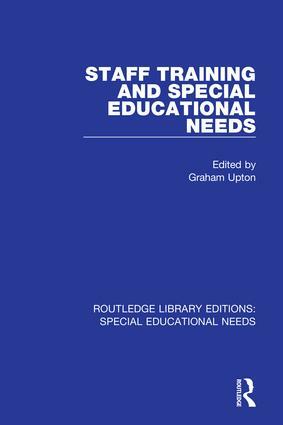 The book was commissioned as a result of the 1990 International Special Education Conference in Cardiff. The contributors, from the USA, Canada, Africa and the United Kingdom, have focused on innovative approaches to staff training. The identification of a contribution as innovatory has been done on the basis of either the description of an alternative method of planning or delivery, a focus of a frequently ignored client group or in relation to the existence of specific problems which affect the provision of training. Graham Upton DL has been Chair of the Board of Experience Oxfordshire since July, 2013. Born in Birmingham, he moved to, and was educated in, Australia, where he taught in secondary and special schools before moving back to the UK in 1972.